This is by way of follow up to a Directive on Social Media issued four years ago by NATO's Supreme Headquarters Allied Powers Europe (SHAPE), the bloc's military command in Europe (which also oversees activities in Israel and until the activation of U.S. Africa Command ten years ago almost all of Africa). It also addresses use of social media for what it calls "operations," which frequently is a euphemism for bombings, missile attacks and all-out war. Witness Operation Allied Force (Yugoslavia 1999), Operation Unified Protector (Libya 2011), NATO Training Mission-Iraq (starting in 2004), International Security Assistance Force/Operation Resolute Force (Afghanistan from 2001 to the present) and Operation Atlantic Resolve (aimed at Russia since 2015). It accuses the Russian news outlet of menacing, egregious, Cold War-era enormities like...unbalanced coverage. That animal, of course, is not known in the US corporate media. "This unbalanced coverage was so systematic that it appeared to constitute an editorial policy of attacking the Democrats while boosting the Republicans. While editorial bias can be seen in many commercial US outlets, RT is neither commercial, nor a US outlet." "Its one-sided midterm coverage strongly suggests that the Kremlin is still attempting to influence American elections through editorial bias in its highest-profile English language media outlet to date - RT - which gets approximately 15,000,000 visits from American readers every month." Indeed RT is not an American outlet. In fact all of its features on YouTube have under them the small-case letter i in a circle followed by "RT Is funded in whole or in part by the Russian government," with a Wikipedia link. The author of the piece focuses attention on November's elections ("attempting to influence American elections through editorial bias," above), yet he bemoans allegedly less-than-kind portrayals of Hillary Clinton (whose first name is consistently spelled Hilary), who last heard is not at the moment running for public office. 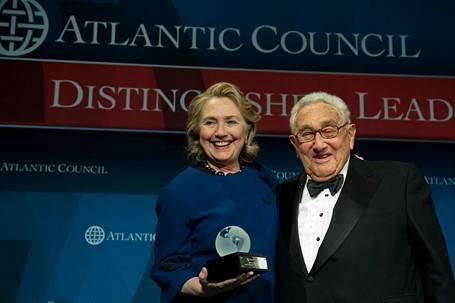 It's more than American elections that the Atlantic Council and its social media partners intend to influence.